Ok, as i'm sure you know gmjhowe and I got married a couple of weeks ago. We wanted it to be very much a DIY wedding, so it seems fitting to publish it on instructables! We have tried to put together some sage advice for anyone else planning a wedding, as well as the crafty things we did to make the wedding our own. The first and most important thing is to choose your venues wisely. This needs to be done first, then everything else seems to fall into place! We actually tied the knot at the church gmjhowe and I have been attending for many years, so that wasn't hard to organise. However for the reception, we wanted to show where we live off to its best (Derbyshire UK) So we wanted a country house, but with out the hefty price!! We found this beautiful place in the middle of the Peak District National Park, called Cressbrook hall situated near Monsal head. It is in a breathtaking valley, and really is in the countryside! Bobby (the manager) gave us a good deal, as we didnt have a sit down meal as such (youll see later what we did), and also as we were married in November (out of season for most weddings), she gave us a good discount! Ok, so once you've booked your venue, Save the Date cards need to be sent out. We thought long and hard about the design of these. We wanted to combine Jake's graphic style with my sillyness. So we both chose a colour we liked (Jake picked dark blue and I picked peacock/teal) and combined it with a contrast colour (silver). Add in some butterflies, and this became the "theme" for the rest of the wedding. The Save the Date cards were designed to look like a tag. We found card/paper in the colours we likes, and decided to go for a layered style with rounded corners (useful having a fiance who works at a print works!) We used eyelets and ribbon to make it look like a luggage or clothing swing tag. The theme is continued in the actual invites, with different coloured eyelets (all in blues and greens) holding the 3 sheets of paper/card together and tied with a bow. We also found some butterfly hole punches of varying sizes, so used this as a motif to show off the layers. These took quite some time (as you can imagine) so for the order of service, we decided to be plain and simple, and just use modified graphics form the save the date, and print a small butterfly, instead of punching one. OK, I originally wanted to make my own dress (how cool that would have been!) but after having tried some on, I decided it would be way too stressful ( though I'd love to attempt a duct tape wedding dress, just for ible's sake!). So I went shopping. And here's my advice... Firstly try everything on!! I went with preconcieved ideas about what I thought would suit me, and I ended up with a dress that was completely different to what I had imagined. The ladies in the store were very nice and not pushy, but they did know what they were talking about. My next piece of advice is to always look on the sale rail. Most of the dresses season to season are very similar in shape and fabric, they just change the beading etc. So I got mine with 40% off, which some how makes it feel better when spending that kind of money. I certainly wouldn't have bought it full price. Beacuse I looked at the sale rail, I managed to get a pure silk dress, with lots of detail. The next thing is to think about your figure. You need to show case the best parts of it - which for me I think is my waist. So the dress I picked is a fishtail style, with almost a fifties feel. You need to make sure you are comfy with how you feel and look, so go back more than once to try it on and think about it! I knew from the start I wanted a something different to arrive in. So we hired a good spec Landrover from a company that hired out farm equipment! We decorated it with ribbons, and my Dad drove it, which he loved! The bridesmaids were chauffeured in our people carrier family car, which looked quite swish with ribbons and blacked out windows! My mum was a star and volunteered to make the cake! She did a really good job. We wanted something simple, so she used the same ribbons as for the invites to wrap round the bottom edege of the cakes, and pinned them with diamente pins. She then used pale blue icing to make polkadots. She also made this awesome cake topper to finish it off, using teal and silver wires, beads, diamentes and two butterflies on springs. Maybe I should presuade her to join ibles! It was then put on a simple stand. The finsihed product was quite effective. After the service we had refreshments for the guests (as it was a lunchtime wedding) so we had cake here too. Famliy friends, Jakes mum and my mum made between them around 300 servings of cake to go with cups of tea! Now I didn't get to make my dress, so I was determined to make the bridemaid's dresses! I found this amazing peacock shot dupioni silk on the internet. As my bridesmaids were all different shapes and sizes, I thought it would be stupid to get them all in the same style dress. I really wanted them to feel that they could wear their dress again to a party or something, so together we picked patterns that best suited them. The only thing that was the same was the hem height so they matched. So I also made all the jewellery and tiaras. I wanted to keep the butterfly theme running so the bridesmaids had a wirey facinator with a butterfly hovering above it. I used diamentes and silk flowers to tone in. I also wrapped wire and beads along the head band in case the band showed up through their hair. I originally bought all the necklaces (including mine which was a white version), because I like the colour of the beads, but I decided I didn't like the design so I tore them apart and made them up again, and believe me this design is much more natural looking!! I wanted all the necklaces and my tiara to have a very organic/vine theme. So I read up some articles and taught myself to bead with wire. A couple of days before the wedding I realised I didn't have a wrap or a bag! So i looked on the internet and everything bridal was hideous and over priced. So I bought some ivory fabric and made a clutch bag and a matching shrug. The bag was very simple, I just used an old sparkly hair slide (which just happened to have a butterfly on it!) to make it a bit more interesting! The shrug is an interesting deign however. It's just a tube of fabric, which is then gathered at the ends and sewn down to itself at an angle. The result is 2 ruched arm holes. When you put it on it keeps your arms and back warm, but still shows off the front of your dress. I had the idea from a similar one on the internet which I was prepared to buy, but retailing at £100 each I was put off. So instead I spent £10 on material and achieved the same result. Waistcoats: There aren't many pictures of them in their full glory, as the lads kept their jackets on more or less all day!! Jakes mum made them from some lovely silver fabric, then made them reversible, using the fabric of the bridesmaid's dresses! She also made matching tie/cravat things for Jake and his best man Chris. A lot of different flowers!! Now teal is not a naturally occurring colour in flowers, (watch someone prove me wrong now! ), so the teal gerberas in the church displays are silk flowers. Pauline, a friend, did the pedestal display, along with the window displays (using silver spray painted vases from Ikea! ), and the porch display. She mixed real white roses and carnations (and spikey names I don't know the names of!) with the gebera, to create a stunning display, whilst also being vibrant! Me and my mum made the bouquets, which were all artifical. It was easier to get them perfect with silk flowers, and we went with the supernatural look, by adding in blue roses. We also used diamente pins and sprigs in diifferent colours to tone in with the Bridesmiads fabric. My bouquet was naturally a little larger, and centred with a large lacey white rose. We bound all the bouquets using the same teal and organza ribbons as before, leaving bits to trail decoratively. We also found some teal/peacock blue feathers which we incoporated. Putting the flowers togther was fairly simple, we just kept to the magic numbers of 1, 3, 5 and 7. bunches in these numbers, and you can't really go wrong. Mum then made the corsages and button holes. There is a picture of my Grandma wearing one of the ladies' corsages, and then a close up of Jake's button hole. These were a combined effort. We wanted to focus on light for decorations, as we knew it would be dark in November! We spotted the stripey and beaded blue/green lanterns on offer at the local supermarket. Then, returning to 3 as a magic number, we decided to have groups of 3 by having homemade decorated jam jars as lanterns. Jake's mum made these - and she did a really good job! She hand painted them with butterlies, the date and our names. She made the handles by wrapping wire round the handle of a wooden spoon, and then decorated these with more butterflies and fish in garlands. We then used the punch waste from making our invitations to use as table confetti. One of the reasons we got a good deal on the venue was because we opted not to have a traditional sit down meal. Instead we chose to have a hog roast buffet. Oh my goodness, I have never tasted pork so good! Jake loved it as you can imagine! Served up with hot mulled wine, and either profiteroles with hot choc sauce, or sticky toffee pudding, it was a veritable feast! Wedding photographers are notoriously expensive, especially if you want the copyright of the photos. Jake and I want to create our own scrap book using the guest book (later step) so it was important to us that we could do what we wanted with the pics, and not have a set number of prints in a formal album. We were lucky. Abi is the cousin of one of good friends. She works for a charity during the week, but as part of her degree she studied Photography. So she does wedding photography on the side (her degree was in image and photography or something...) She took heaps of photos, and gave us the copyright, without having to purchase an expensive and unwanted formal wedding album. She was a star as well, very helpful and smiley person! At the church we asked our regular band to play - and they did a fantastic job! We did have the organ to play us in and out, but the majority of the music was played by these guys. And they were awesome - thanks guys! They even did one hymn with the band AND organ - rockin!! At the reception we had an acoustic father-daugther duo called "Keeping Up With The Joneses". The daughter Ffion actually works with my brother, and is a preforming arts teacher. And she has the best voice I've ever heard! They write their own music, along the lines of american blues. But they also take popular music and acoustic-it. So we had Super Massive Black Hole, Summer of 69, Crazy Little thing called love etc....Thanks to them aswell. In between sets we had the good old iPod with a play list of mine and Jake's favorite songs. 7th of november - near enough to Bonfire Night! So some family/friends did some DIY fireworks -quite spectacular! Jake made the guest book and he did a fab job. Using his book binding skills he used some of the fabric from the waistcoats and the bridesmaid's dresses to cover the padded cover. This book has two uses, instead of the traditional wedding album, we always wanted to have a scrap book - hence the reason we wanted a photographer who would give us the copyright to our pics. So he made the book so it can be taken apart - the pages and covers are held together with bolts, so we can reorder the messages people left us, and then disperse them in between photos and other momentos. The window in the front currently says "guest book", but will be swapped for a photo when it is a scrap book. A Chocolate: To remind you of the finer things in life. 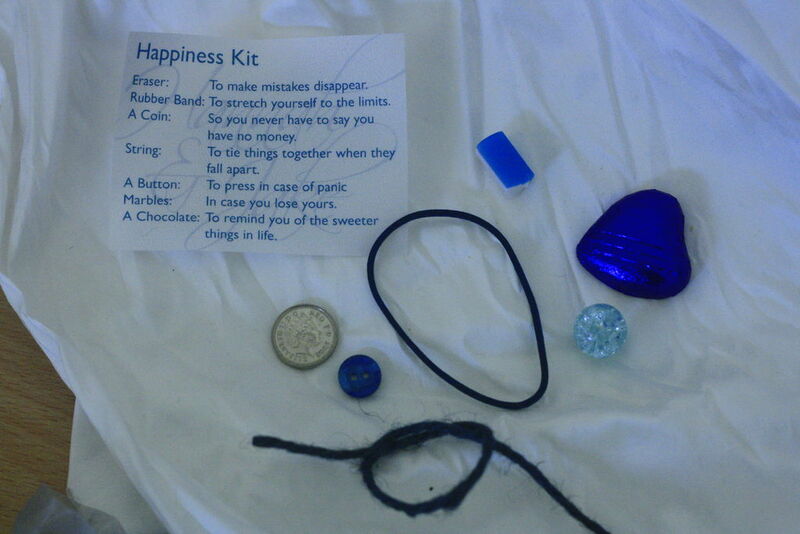 We got all these items in blue colours (mainly from ebay), and then stuffed them in silver organza bags. I then decorated a basket with the remaining trimmings I had, to hold the favours. The first and most important thing is to choose your spouse wisely. This needs to be done first, then everything else seems to fall into place! ...have you seen the list of guides to the right of the page? Ouch. Too soon, in all senses! The honeymoon is not over...until she says so. yay - purple is a great colour! Your wedding is so beautiful! I would have never known anything was handmade, especially the tiaras and the cake. What a lovely wedding, and it looks like it was fun too! Thanks, and Congratulations to yourself! Are you planning a crafty wedding?